I have finally taken the time to sit down and finish a whole afghan. I know it seems a small task but I typically stick to quicker patterns and designs like scarfs and handbags. Completing this larger blanket is a pretty big accomplishment for me. I used a few different patterns and a little bit of improvisation to complete this afghan. 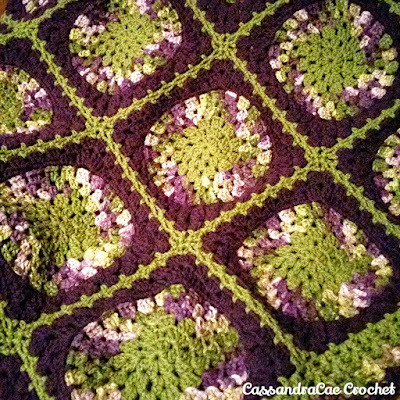 In this post, I am going to explain my methods and share with you where I found all of my supplies to make this blanket. Close up of my finished afghan. As I said before this pattern afghan came together quite fast. I have a couple of other blankets I have been crocheting on for months but from start to finish, I was able to complete this afghan in about 2 weeks. Once I started working on it I just could not put it down. 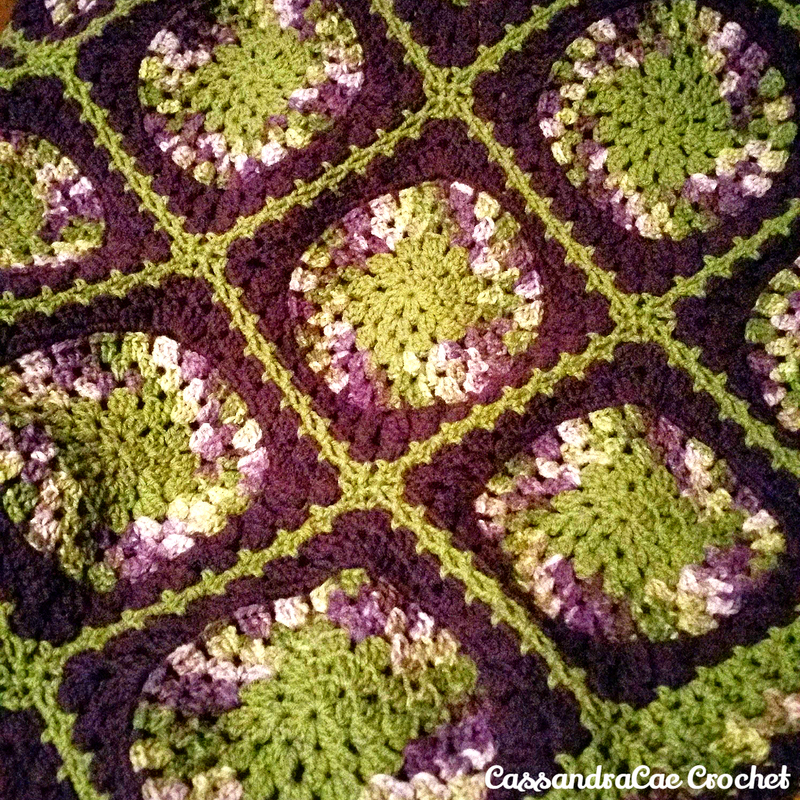 I used the "Squaring the Big Circle" free crochet pattern to make the squares of this blanket. It was created by Kate Jenks and it can be found on her blog. You can also add it to your Ravelry favorites so that you can crochet the pattern later. 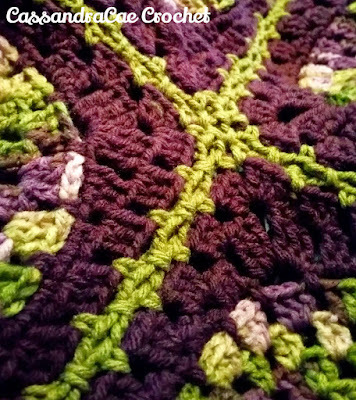 It's a super simple pattern but do not fret if you are not the best at reading the foreign language that is crochet and turning the abbreviations into projects. Kate also provides a photographic step by step tutorial so that you know you are completing each row correctly. The yarn I used for my project was all purchased at Micheal's and it is their Loops and Thread Impeccable store brand yarn. It is a pretty good budget yarn and a little softer than other brands of acrylic on the market. 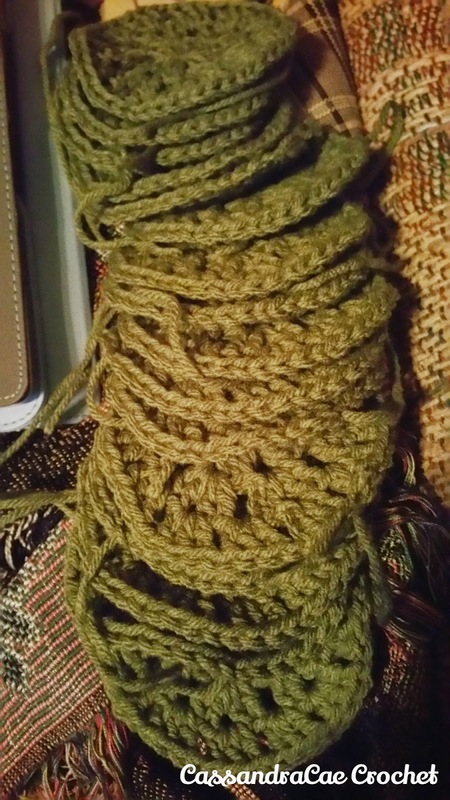 My only disappointment with this yarn is that the center pull skeins seem to never want to pull from the center without creating knots. 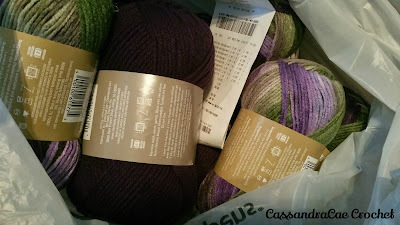 It is not enough of a problem to keep me from purchasing the yarn in the future but I definitely try to catch it when it is on sale, rather than picking it up at full price. I used the colors Fresh Lilac, Forest, and, Lavender. The purple and green mixed together really just pop. I saw the Fresh Lilac first. It was just so pretty and had so many different colors. Looking around, I found the Forest and the Lavender which I knew would just make my blanket a statement piece. My trip to the yarn store to buy supplies for this blanket. I started the pattern and divided the colorway into thirds since I was only going to be using three colors for my blanket. Kate used a bunch of beautiful and vibrant colors and her rainbow blankets are to simply stunning. Make sure you stop by her site and check them out, but I was looking for something a little bit different. I started with the Forest, added the variegated in the middle so that I could transfer to the Lavender so that it all would really pop. I crocheted a bunch of little circles for a total of 20. I was planning for my afghan to be 5 blocks in height and 4 blocks in width. I then added a few more rows and those little circles became larger circles. addition of the variegated yarn. "Squaring the Big Circle" made with green and purple. 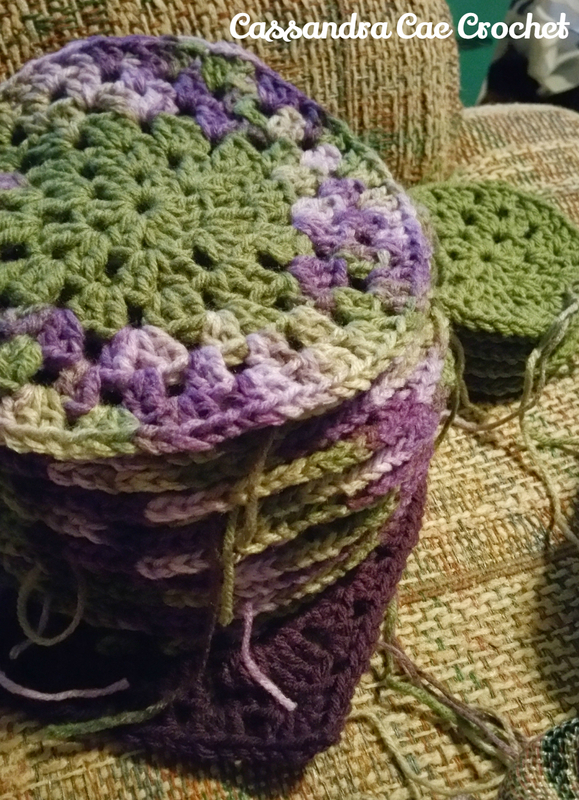 To recreate my square, you will crochet the first three rounds in Forest, the next three rounds in Fresh Lilac, and the last three rounds in Lavender. 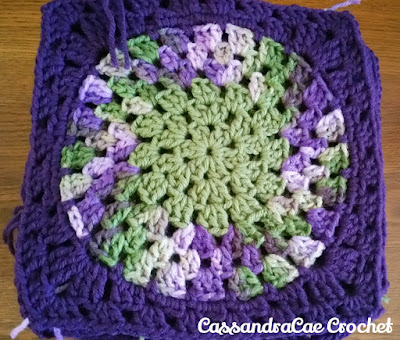 Next, I wanted to find a simple yet intriguing way to join all of these crochet squares. When you are finished with these crochet blocks, the edge looks like the traditional granny variation. That makes it really easy to find a joining technique that will work well with this pattern. There are so many out there. The one I chose is very easy. I finally settled on a "Simulated Braided Join" and I used a tutorial by Kate from Signed With an Owl to achieve the finished result. After that was finished, I added a few rows of V-Stitch in the Fresh Lilac Color and added a Lavender Border with a simple shell stitch. A simple finish for a simple blanket. If you have any questions please leave them in the comments and I will get back to you with an answer. I really enjoyed making this blanket and I hope you do too! 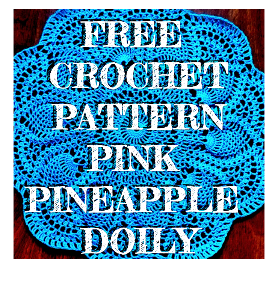 Looking for more free crochet patterns? 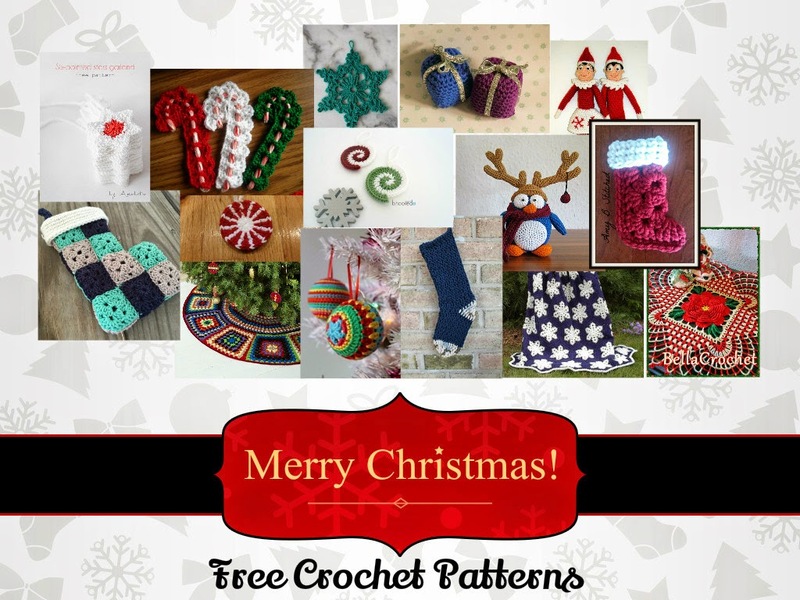 Check out the Top Trending Free Crocheting Patterns (affiliate link) at Craftsy.com.